Hard to believe this. It has a minerality and intensity like a great white wine with so much chalky character that it gives an oyster shell flavor. Full and racy. Shaking my head in intrigue. Wonderfully silky tannins. 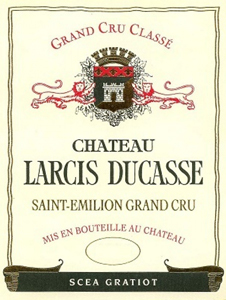 The 2015 Larcis Ducasse has a tightly wound bouquet with blackberry, cedar and tobacco aromas that take time to find their voice. This is far more introverted than older vintages, more cerebral. The palate is medium-bodied with supple tannin, crisp acidity, lithe in the mouth with a strict and quite linear, tertiary finish. It just needs a little more expression but that will hopefully come with time. This is a long-term Larcis-Ducasse that is going to bide its time, but there is nothing wrong with that. Anticipated maturity: 2025 - 2050. One of the stars of the vintage, the 2015 Larcis Ducasse is intensely aromatic, silky and totally sensual from the very first taste. The purity of the fruit here is striking. Even so, it will be many years before the 2015 is ready to show all it's got. Today, it is the wine's total sense of harmony that is absolutely alluring. A rush of raspberry jam, pomegranate and blood orange leaves a lasting impression. The 2015 is a dramatic, richly-textured Larcis Ducasse long on class and pedigree. The blend is 87% Merlot and 13% Cabernet Franc picked between September 28 and October 12 and aged in 50% new oak. Tasted two times. Tasted blind. Toast and lift and interest on the nose here, but it’s a bit heavy and stodgy. Rather raw tannins on the end. Dry, sudden finish. Intense but mellow nose. Rich and round on the palate with some zest. A light animal note gives this drama. But it's not forced. Just a slight vegy note on the end. A good, powerful, chunky Larcis with a firm attack and a nice compact chassis. This will do well over the medium term.